I have visited Russia a number of times, mainly Sankt-Peterburg. Why was I there? USAID, a US government foreign-aid agency, gave money to AIHA, the American International Health Alliance, a non-profit organization based in Washington DC, to set up partnerships between hospitals in the US and hospitals and medical schools throughout the former Soviet Union. Jewish Hospital in Louisville, Kentucky, was partnered with a hospital and post-graduate nursing school in Sankt-Peterburg. I didn't work for the Louisville hospital, but I knew the project coordinator there and she found me useful. I like to travel, especially off the beaten path, and so I could handle being in Russia just fine; I had taken enough Russian at Purdue that I could get around on my own; and I could figure things out and fix stuff with next to no support. It was a long project split over several short trips of a few weeks each. I have split this into multiple pages. Look at them in order or jump around. 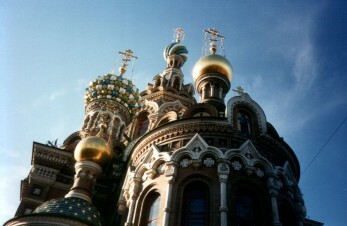 The Church of the Spilled Blood, Sankt-Peterburg.